Tue., June 19, 2018, 11:55 a.m.
Kennard McDowell went 2 for 3 with an RBI and the visiting Boise Hawks (3-1) edged the Spokane Indians (1-3). Spokane starter Seth Nordlin went five innings and allowed one run on two hits and no walks with three strikeouts. 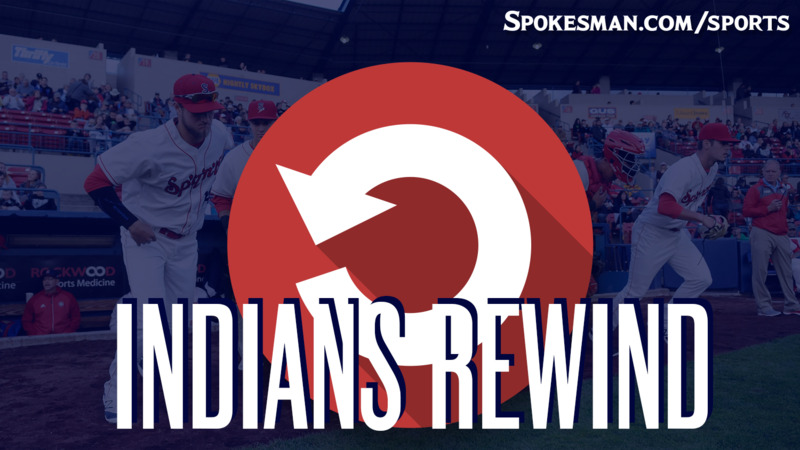 Curtis Terry and Miguel Aparicio hit solo homers for Spokane. The big play: Curtis Terry tied the game at 1-1 with a long homer to left in the fifth inning. With one out. Hasuan Viera singles and the Indians had something going. Isaias Quiroz popped out but No. 9 hitter Tyler Depreta-Johnson ripped one to third and Danny Edgeworth wasn’t going to have a play. But Viera was running hard with two outs and when Edgeworth faked a throw to first, Viera bit and rounded second – hard. By the time he realized the third baseman still had the ball, it was much too late. Viera hit the brakes, but he was an easy out in a short rundown to snuff the Indians rally. The Good: Terry homered for the second day in a row, pulling a massive clout to dead left field. Miguel Aparicio (3 for 4) did the same to right in the bottom of the ninth, clearing the plaza next to the caboose. Starter Seth Nordlin continued the string of strong starting pitching, allowing just one run on two hits and no walks with three strikeouts. Nordlin said his opening day relief appearance helped to ease into pitching in front of a pro crowd. “The relief appearance was big because it got the jitters out of the way, got my nerves out of the way,” he said. The Bad: Other than the two home runs there was not much offense to speak of, considering Aparicio had three of the Indians’ six hits. The Ugly: The Hawks’ eighth. Royce Bolinger had one on with two down, but uncorked a wild pitch, then was hammered by back-to-back batters for line drives which plated two runs. He’s a position player converting to pitcher so his progression is a work in progress. The Takeaway: The Indians continue to get good starting pitching, which is something to hang a hat on. But until they can start stringing some hits together the wins are going to be infrequent. Next Game: Indians vs. Boise in the last of a five-game series at 6:30 p.m. on Tuesday. Minor League Report: Monday’s Northwest League and Texas Rangers affiliates results. Published: June 19, 2018, 11:55 a.m.